The festive season is upon us! Well, from how Hong Kong's been looking, it's been on us since 1st November apparently. I love Christmas, but I can't get into the spirit properly until later November at least! But we're now firmly into December and I'm getting more and more excited! Though it is weird to still be so warm outside. I still need to do all my gift shopping, and we haven't got around to any decorating in the flat yet (though there's a thought for tomorrow...). Anyway, despite my excitement, I'm exhausted at the moment, with a bit of cold, so I'm just generally a bit run-down I think. 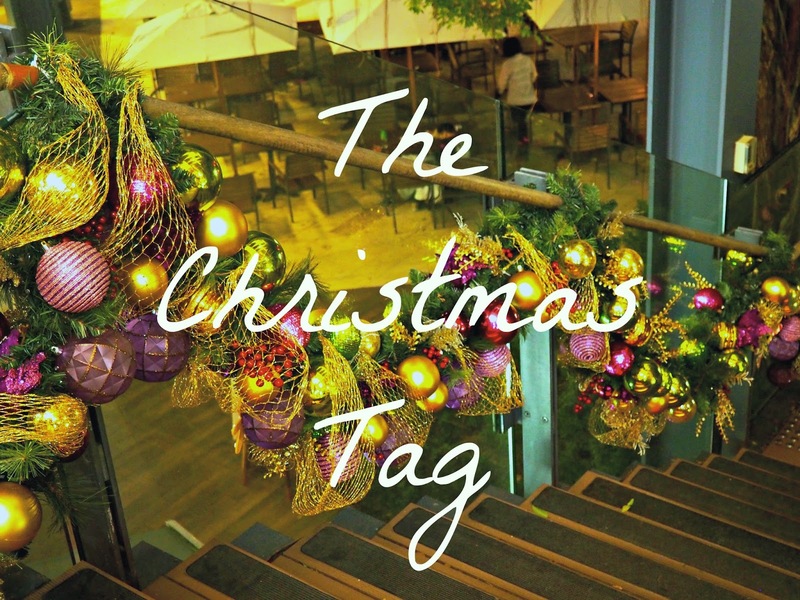 So today's is another quick tag post, this time with a very festive theme! The Santa Clause! I feel like it's not one of THE most popular out there (I'm so over the hype around Elf, sorry guys!) but it was one of the few we had on DVD when I was younger so we'd watch it every year, and it's still my favourite now. Oh yes! Not as many as I would have liked, but living in Scotland means we do get snow most winters, and although it isn't always white for Christmas, there have been a few over the years. Sometimes we've also had snow on the ground, but none falling on the actual day. Either way, it makes it feel more like Christmas for me when there's snow somehow! At home or at my auntie's house. I've never had a Christmas away from my family yet, and the specific location of the festivities doesn't matter too much, as long as we're all together at one of our houses. Christmas Day is with dad's family, and on Boxing Day we do it all over again with mum's (usually my grandparents' house or my auntie's). Although it doesn't feel that festive, I'm very fond of The Pogues - Fairytale of New York. Slade - Merry Xmas Everyone is a good one too, and a bit cheerier. I also really like a lot of carols for Christmas time, as that's what I always associate when I was growing up, and I learned to play a lot on the piano. I also found this cover a few years ago by Joe Brooks (I like his own music too!) and I think it's a lovely one. Nope! My friends and I have occasionally opened ours together before the day, but only once or twice. Everything else has to wait until Christmas morning! Yep - on Dancer, on Prancer, on Dasher & Vixen, on Comet, on Cupid, on Donner & Blitzen! And Rudolph of course. This year is a funny one, as I'm away for most of the run-up to Christmas, and only get home on 23rd December. So while in Hong Kong, I'm enjoying seeing all the light displays, and I want to decorate the flat. At home, I'm mostly looking forward to seeing family again, stuffing myself at Christmas dinner, and definitely colder weather! It's way too warm for Christmas right now! I'm going to get a little fake one for the flat, but the big one back home always has to be real, and is usually about 8-9 ft tall! 9. What is your all-time favourite holiday food / sweet treat? My dad roasts chestnuts leading up to Christmas every year, and they always feel very festive. Christmas dinner is pretty awesome from start to finish, but I'm a particularly big fan of stuffing. Other than that, I love chocolate at any time of year! 10. Be honest: do you like giving or receiving gifts better? When I was younger I'd say receiving, of course, but as I get older, while I'm still very grateful to get gifts of course, I'm always asked what I want first, so there's little surprise anymore. I get a bit stressed about buying sometimes, but I love it when I find something that I know that person will appreciate. I'm completely blanking right now. I feel like there's something great I've totally forgotten about! I did get the results of my first ever piano exam one year, which wasn't so much a gift, but was a lovely surprise to open. My brother and sister and I all got pretty excited the year we got a Nintendo Wii, and although I've since replaced it with a better one, I was very happy the year I got my first digital camera. I got my piano one year, easily the best thing my parents ever got me, but it was a combined Christmas/birthday/exam result gift that I got in February, so I don't associate it with Christmas that much. Honestly, I've never wanted to spend a Christmas anywhere other than home, but I think it would be pretty cool to see all the holiday stuff in New York, and I'd love to see the reindeer and snowy scenery in Lapland, or somewhere similar. I'm so good at it! Well, pretty good. My mum does such lovely presents every year, always with a colour theme and nice ornaments, so mine aren't a patch on hers. But I have started putting in more effort with mine, so they look pretty decent! The first thing that popped into my head was going sledging with my cousins who were staying with us a few years ago, on Boxing Day morning. We only have a couple of sledges, so we also used sheep feed bags from the farm, and there was a lot of hilarity and falling over. We also pranked the same cousins (who used to stay most years when we were younger, but they're grown up now) by waking them up on Christmas morning by putting a singing Santa in their room, which they couldn't figure out how to turn off. I honestly can't remember. I think a combination of seeing films etc that hinted at him not being real, and friends at school already knowing the truth made me cotton on. But there's was no sudden devastating, revelatory moment for me. And as the oldest child, I had to keep up the pretence for a good few years before my younger brother and sister both realised. Being with family is the big one of course. I love the lights and decorations and food, and that sort of feeling of warmth around this time of year, but none of it would be the same if I weren't at home.